Baltimore Event Alert: Thu, 7/24 @ 5:30pm Pop-Up Event with Jarrett Walker! 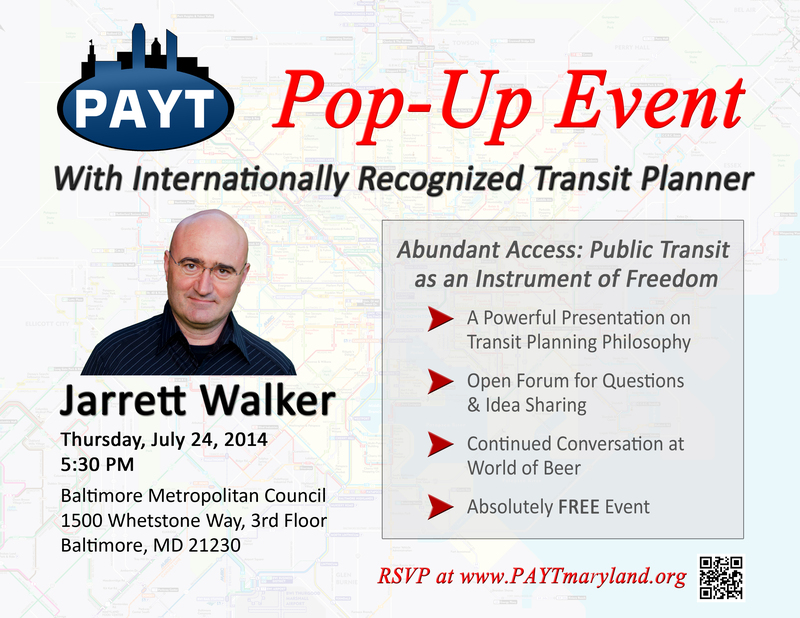 Mr. Walker will be presenting on “Abundant Access,” how to design systems to maximize urban freedom. If you are not familiar with Mr. Walker’s work, this is bound to be an eye-opening event. His presentations are thought provoking and stimulate dialogue. Accordingly, we will provide ample opportunity for questions and idea sharing. Mr. Walker will be speaking at 6:00pm, and following the event, we will continue the dialogue at World of Beer. On on-site parking is also available, and we encourage you to consider carpooling. If driving, please park in the west parking garage; security will be notified of this event and the two hour limit will be waived. This is a great opportunity to interact with a great mind in transit planning and to also network with colleagues in the transportation industry. Please RSVP here. Look forward to seeing all of you soon!